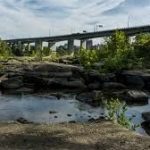 Volunteers will be cleaning trash from the river and shoreline between Bent Creek and the park, which is about a 6 1/2-mile stretch of the James. Canoes, life vests, paddles and a guide will be provided to volunteers. Please come planning to get wet! Volunteers will be in and out of the boats to retrieve trash. This paddle takes a while, so volunteers are asked to be prepared to be there by 9 a.m. and on the river until about 2:30 p.m. The Rice Rivers Center is Virginia Commonwealth University’s field station on the James River, in Charles City County. The shoreline is wadeable, and sturdy water shoes are a must. Some inland access areas along Kimages Creek are wooded and somewhat steep. Trash grabbers, nets, and insect repellent will be provided. Kayaks and canoes are welcome and can be launched near the pier. There is no boat launch. The property boundary along Route 5 (about one mile) is an additional area for litter pickup. 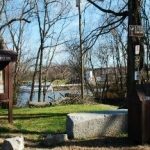 The Dutch Gap Boat Landing and Conservation Area provides excellent access for those wanting to clean up trash while walking or by boat. The Conservation Area is divided into two main sections. The first is accessed at the parking lot near the registration area. An easy and flat one-mile trail along the James River allows access to tidal beaches, wetlands and forest. It is a one-way (nonloop) trail. The second section of the conservation area is accessed by a 4.5-mile loop trail that circles a tidal lagoon and provides access to wetlands and forest. A shuttle will transport volunteers from the registration area to the trailhead of this section. The boat landing at the parking lot is on a broad and flat tidal section of the James River. It gives boaters access to many miles of riverfront and several small creeks. Motorized boats and paddle craft can access the river here. Paddle craft (canoes, kayaks, etc.) are ideal for some of the smaller creeks and shallower parts of the river that are not maintained for commercial navigation. There is plenty of deep water access for larger boats, as well. Falling Creek Ironworks Park has recently been improved and will open to the public this summer. The park was added as a JRAC site in 2005 and has been growing in participation every year. Access to the creek creates challenges in most places, due to thick vegetation and steep slopes, but has been improved on the south bank near the falls. Prepare to get dirty and work in pairs for safety. Boat access would have to be from the James River and will need to be timed with high tide to get below the falls. A new access from the north bank has been added off Station Road. Work with site coordinators for this area of the park. 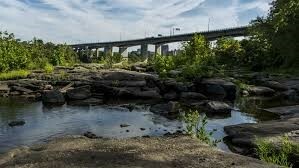 In the future, new parkland downstream and along the James River will be added for cleanup activities, as access areas are developed. Falling Creek Reservoir is a 110 acre lake located on the Chesterfield County/City of Richmond border within the Upper Reservoir District. It feeds directly into the James River. 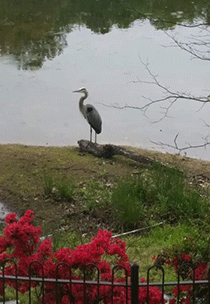 Visitors will see blue herons, eagles, osprey and a host of other water fowl. Volunteers will clean up trash from the shore line and water. Volunteers who have canoes/kayaks are needed as well as Reservoir residents who have boats. There is trash for shore-line volunteers to pick up along the roadways that surround the Reservoir. Appomattox River Regional Park offers over 67 acres of wooded trails with a kayak launch and observation-fishing pier on the Appomattox River (a major tributary of the James River). Additional amenities include educational shelter, a ten station fitness trail, and restroom facilities. Volunteers will clean up trash from the shore line and water. Volunteers who have canoes/kayaks are needed and some kayak are available for use during the clean-up from Hopewell Recreation and Parks. Percival’s Island is a familiar landmark in downtown Lynchburg. Volunteers will clean up all over the island, including along the water’s edge. 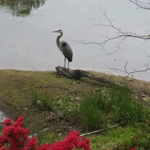 Visitors may see herons, migrating waterfowl and many native plants and animals as they follow the paved trail. There is a flat, handicapped accessible, paved trail on the island. Percival’s Island is located at 1600 Concord Turnpike. Participants should use the entrance near Jefferson Street and Concord Turnpike. Huntington Park is nestled at the base of the James River Bridge in Newport News. There is a small, sandy beach that is somewhat of a surprise to find in this urban setting. Huntington Park is home to Fort Fun, a 14,000 square foot playground that is located on a scenic bluff overlooking the James River and Lake Biggins, a small lake. The beach is in much use during the warmer months, although people frequent the location in all seasons to enjoy the view of the river and the James River Bridge. Patton Park is a passive recreation area along the Appomattox River near Virginia State University at Campbell’s Bridge. The area includes trails, picnic area, canoe take-out and New England style covered bridge. The Appomattox River is a major tributary of the James River. Volunteers will clean up trash from the shore line and by the water. There is trash for shore-line volunteers to pick up along the roadways that surround the Park. 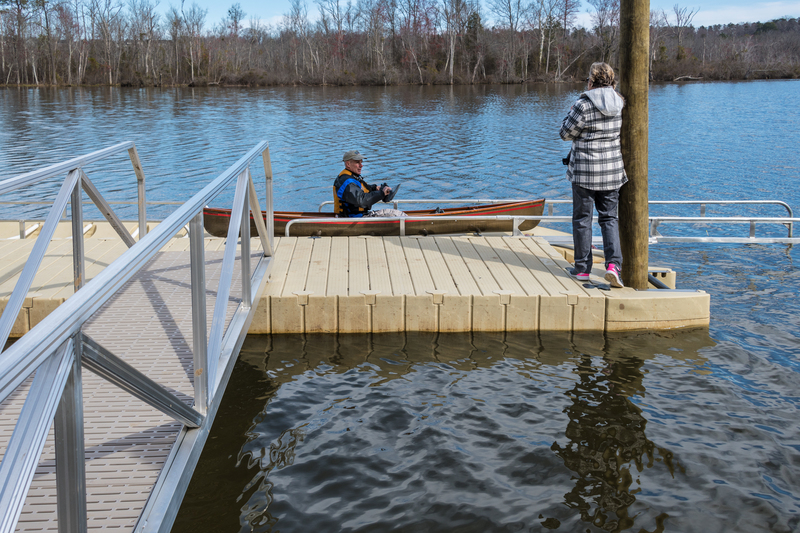 The easternmost section of the Park, it’s a popular fishing spot with a concrete boat ramp and a parking lot that accommodates over 100 cars and trailers. It’s also the beginning of the Richmond Slave Trail. This section is located at the end of Brander St. Take the Maury St. exit off I-95 and turn right. The main access to Belle Isle is by pedestrian footbridge from Tredegar St. on the north shore (zip code 23219). Alternate access is by wooden bridge near 22nd St. or by rock-hopping from the south shore. Parking tends to be crowded at Tredegar St. on weekends — only about 50 spaces. Large flat rocks surrounding the island make for good sunbathing, but the water is rough around the rapids and not suitable for swimming. Children should be supervised. 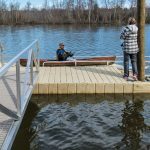 Additional features include wooded trails, mountain biking trails, interpreted historical sites, wheelchair-accessible fishing at the quarry pond, and a granite wall for rock climbing. This site is being cleaned in collaboration with Clean Virginia Waterways of Longwood University which organizes the annual International Coastal Cleanup throughout Virginia. Brookland Park Boulevard RVA Clean Sweep launched in 2016 in collaboration with various civic groups including Battery Park Civic Association, Brookland Park Area Association and Embrace Richmond. 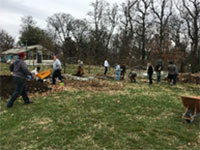 Jointly, the groups coordinate a monthly trash pick-up in the community. For this special collaboration event we invite volunteers to join us to focus on the Richmond-Henrico Turnpike corridor, from Brookland Park Boulevard to Valley Road. We will meet at 2901 Woodrow Ave. Richmond, VA 23222 – The Community Garden behind Richmond Community High School. The garden bloomed from a plan that students from Richmond Community High School created in 2014. Their vision for the open space and greenhouse next to the school is for a safe and nurturing place for residents and students to teach, learn, grow, collaborate, and build a sense of community around healthy food. Immediate plans for the Community Garden include an orchard, raised bed plots for residents to grow food, and a flower cutting garden. We desire to help preserve and protect the environment and promote a healthy and sustainable lifestyle and hope to bring awareness to these goals through picking up litter in the wooded and green space areas surrounding the community garden, and alongside the 1.9 mile stretch of the Cannon Creek Greenway bike and walking trail. Manchester is a vibrant urban Southside neighborhood the drains directly into the James River. Manchester Alliance and RVA Clean Sweep along with community partners have been working hard to reduce trash pollution and bring awareness to the community. Volunteers will focus on cleaning up litter on side streets between Hull Street and Bainbridge. Volunteers will meet on Hull Street at the Manchester Courthouse at across from the McDonald’s. Ages 12 and over at this site. Like Reedy Creek, Pony Pasture Rapids is part of the James River Park System and is a natural park within the city limits of Richmond. The waters at Pony Pasture Rapids are excellent for wading, depending on the river level, and there is plenty to clean up along the shoreline and the many trails throughout the park. There are always extra projects to do at Pony Pasture Rapids during the river cleanup, including mulching, painting and clipping along trails and roadways. It’s an excellent place for paddlers in kayaks and canoes to float the river between Huguenot Flatwater and Pony Pasture Rapids. There are plenty of small islands that can always use some sprucing up. Reedy Creek serves as one of the four hubs for cleanup in the James River Park System. From Reedy Creek, volunteers can travel on foot along the trails, to the rocks downriver of the nature center, along Reedy Creek, 22nd and 42nd Streets, and Sawmill Island. Reedy Creek also has a boat ramp for kayakers and canoeists. Paddlers are needed to clean up Archer Island, Pawpaw Island, Goat Island, Bohannon Island. This site can accommodate large and small groups, young children, paddlers, and adventurers. There is something for everyone! Lunch is served at this location. Tucker Park is located along the James River with about 35 acres of open space on either side of Route 522. The western portion of the park is made up of a mile-long walking trail, environmental outdoor classroom, stage/amphitheater, and picnic areas. A non-motorized boat launch is available on the eastside of Route 522. The park is frequented by many County residents and needs to be cleaned up often, as well as the park’s river banks. Litter cleanup is also needed along nearby roads. Osborne Park and Boat Landing is predominately a site for boaters due to the outstanding launch facility located at the park that provides easy water access to miles of the river. Located on the lower, tidal portion of the river, Osborne is an excellent site for participants using power boats, but is open to paddle craft, as well. There is trash for shore-bound participants to pick up, but the bulk of this site’s trash is collected by boaters who are more easily able to hit trash hotspots up and down the river. Maidens is a public boat landing with several access roads and a large parking area where cleanup crews will pick up trash. Boaters and paddlers are needed, as there are several small islands in need of trash pickup that are easily accessed.